TODAYS jet Fighters are among the fastest planes ever built. The F-16 Fighting Falcon, for example, can fly at more than twice the speed of sound. Alodern fighters use “fly by wire” flight. This means physical cables no longer pull on control surfaces su ch as the rudder. Instead, computers send signals along electric wires to motors that move control surfaces. To increase speed, supersonic fighters today have streamlined bodies with pointed noses and swept-back or arrow-shaped wings. Some have ultra-thin wing edges to reduce drag and cut through air easily at high speeds. To withstand the scorching heat of supersonic speeds, the planes have "skins” of heat-resistant metals such as titanium. Most fighters intercept and attack other aircraft. They may also attack ground targets. Pilots today locate targets electronically and fire deadly radar-guided or heat-seeking missiles. 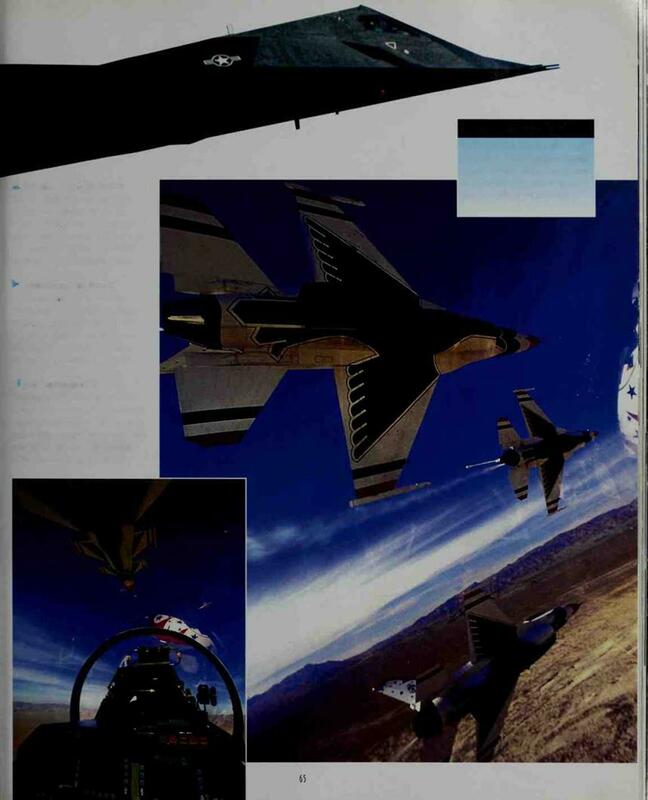 Modern fighters can cost up to $50 million each! MucJj of the cost is for electronic radar, flight, and navigation systems. This F-18 has been modified to test a new feature. Strakes, hinged structures on its nose, open to stabilize the jet as it dives at a steep angle of attack. They give the pilot better handling in an otherwise dangerous maneuver. 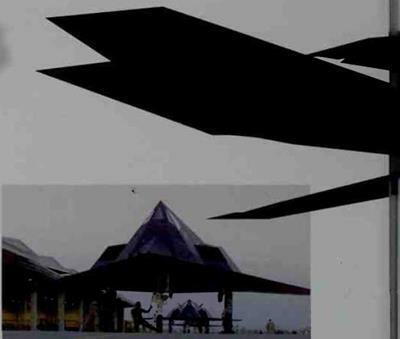 The first "stealth" plane in combat, the F-117A (above and left) flew in the Persian Gulf War in 1991. Its shape and special paint scatter radar beams to help it fly undetected. Hunting at night, the Nighthawk fires laser-guided missiles. F-16 Thunderb! rds, the U. S.Air Force demonstration team, roar into a Diamond formation. A pilot’s view (below) shows how close the jets fly. 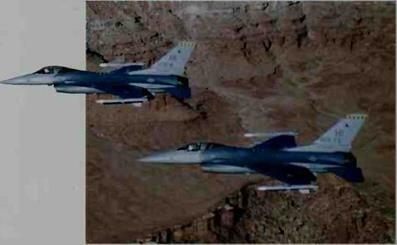 Such maneuvers showcase both the pilots’precision and skill and the capabilities of the F-16. 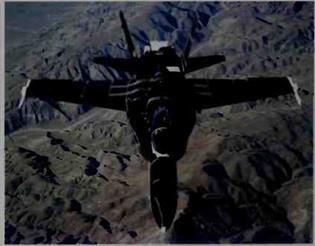 Sweeping down from the sky, an A-10 Thunderbolt II dives to attack. Designed to support ground troops, it can fly low and slow to destroy targets such as tanks with guns and missiles. 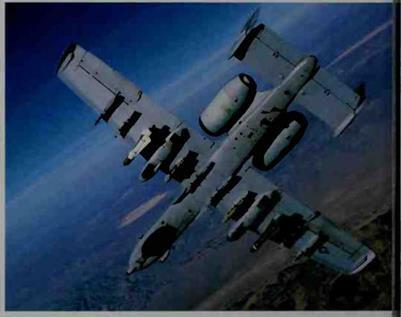 The A-10 served in rescue missions during the GulfWar.